Pine trees mature at 6–12 years of age and develop separate male and female cones. 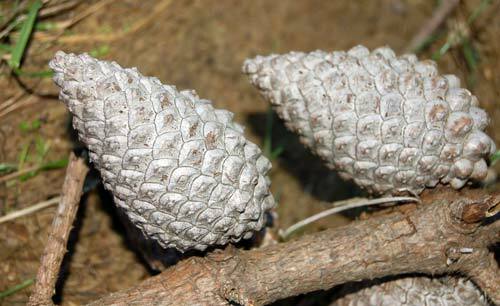 The female cones usually grow on the outer, higher branches of the tree. They take about two years to mature into a conical shape, 7–13 centimetres long and 4–9 centimetres at the widest point. When ripe, their scales open, releasing winged seeds.